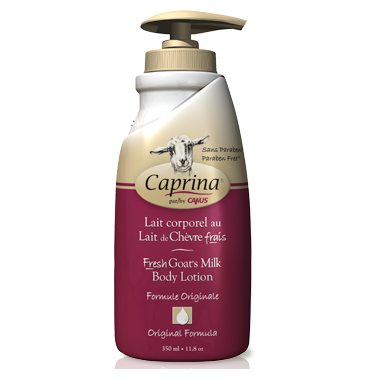 Caprina body lotion contains fresh goat’s milk, a natural and highly effective skin moisturizer. Original is the signature Caprina formula. The first of all their formulas, it continues to be a favorite amongst their customers. All the beneficial properties of fresh goat’s milk are combined with subtle essentials oils derived from natural ingredients. Caprina body lotion is non-greasy, absorbs quickly and helps restore your skin’s own moisture levels for 24 hours. Ingredients: Aqua, Stearic Acid, Glycerin, Dimethicone, Glycine Soja (Soybean) Oil, Cetyl Alcohol, Isopropyl Palmitate, Glyceryl Stearate, Glycol Stearate, Caprae Lac, Isopropyl Isostearate, Caprylyl Glycol, Parfum, Potassium Sorbate, Tetrasodium EDTA, Triethanolamine, Benzyl Benzoate, Limonene, Linalool , Eugenol,Geraniol, Citronellol. Great to have this product that is good quality and made in Canada. I prefer this over more expensive, similar product I have tried. thank you for offering this Well. I love this product but it is difficult to find. As well, your price is even better than e-Bay prices! The smell of this product is so lovely that I use it a little like perfume. The smell of it also helps me get to sleep. It is a great moisturizer. Highly recommended. I have been using Caprina goat's milk body lotion for quite awhile . It's great stuff -- but lately I haven't been able to find any. So I was really pleased to order some from Well .ca I appreciate their excellent service . Love this cream and it smells so nice and clean. This is a wonderful cream. I love all of Caprina goat milk products. The smell is fantastic. It's not too greasy and absorbs quickly. I have been using this for a couple of years and it was never hard to find in NS but a recent move to SK has had me searching everywhere with no luck finding it. Thank you well.ca for coming to the rescue and carrying this great product! Great cream. No argument there. There was a container defect issue: The cap would not twist open to get the pump action working. I had to take the cap apart and force the pump to open. I have been using Caprina Goat milk lotion since 2000. Since they were not available in Toronto, I stocked up at a Great Tiger store whenever I visited London, Ont. For a while,Shoppers Drugmart in Toronto carried it, but they stopped stocking it. Fortunately, Well.ca carries it! I love it when my husband compliments me every time I use this lotion by saying: you smell fantastic! The scent is not heavy, and the lotion has great moisturizing properties. I've seen this lotion in stores for years and finally decided to try it, after a winter of using a natural/organic lotion that left my skin dry and cracked. After almost 2 weeks use, I can see a noticeable difference in my skin. This lotion absorbs quickly and leaves a non greasy feeling, also has a light refreshing scent. Great product.. Wish I had tried it sooner! This lotion is great. It absorbs quickly and keeps my skin hydrated. Been using it for a couple of years and was having troubling finding it in a store. I don't shop online very often and was skeptical about trying. It turned out great. My product arrived in less that a week. Well.ca has exceptional service, and I give then 5 stars. I have used this cream before and everytime, I am amazed at the silkiness of my skin afterward! Furthermore, I love the smell, reminds me of baby powder and fortunately, the smell is great but does not "overstay". Please put 5 stars as I can't seem to be able to do so. Ordered this product through Well.ca as I was having trouble finding it in local stores. Didn't trust ordering online but I'm very pleased with the service I received. It took less than a week for my product to arrive. Well.ca receives 5 out of 5 from me. Satisfied with the product and purchase. Love it. . I have very sensitive skin and this product has always reacted well on me. I am 62 yrs old and my skin is softer than a 20yr olds and I think its because of this product. I use it after every shower and love the smell. Very affordable as well. This is a favourite in our house! Living in an arid climate with sensitive skin is a challenge; this lotion moisturizes all day without feeling heavy. The clean scent is not too overpowering to wear in a scent-free work environment...and I love that it's Canadian! Lathers nicely, not much needed. Fresh clean scent but not too powerful. I ordered this for my husband because he has really dry skin, especially in the winter. He has eczema on his hands which is irritated by both wearing hockey gloves and playing guitar. This cream is great- it moisturizes nicely. I use it as well, and I find my hands don't feel dry quickly after they do with some other creams. The only complaint is the smell- next time I will purchase a scented version, as I am not a huge fan of this scent.